Spotlight is the story of a side line investigative group of the Boston Globe and their 2001 investigation into the Catholic Church’s covering up of child abuse crimes. It is a film of difficult theatre experience in the same way that it is difficult to discuss as just a film, but nonetheless it puts forward a plot of immeasurable importance and long lasting effect on the viewer. The story begins with Marty Baron, the new editor of the paper, who wants the Spotlight team to investigate claims that prominent members of the Church covered up the actions of certain priests within the area for decades, allowing them to be relocated and for their crimes to be left unpunished. The team are hesitant at first, highly aware of the significance of the Church in Boston but are soon swayed enough by the mounting evidence and victim testimonials to take it on. 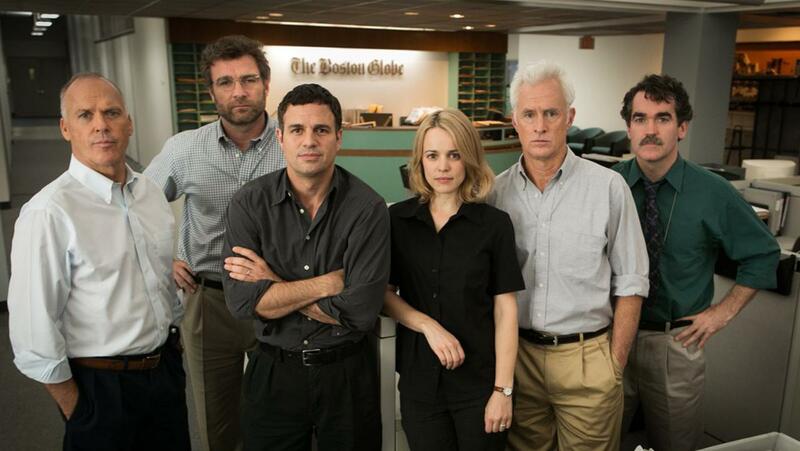 The plot moves gradually yet progressively alongside Spotlight’s grasping of the significance of what they’re about to reveal, not only to the State, but to the world. In what seems from the get-go a highly un-Hollywood production, you automatically forget that the main characters are played by some of the system’s marvels. Keaton, McAdams, Ruffalo, Tucci, step off from popular and evocative entertainment dramas for the sake of bringing this story before an idealized and poppie Hollywood. Instead, the film is raw and steadily tense and it importantly does not play up the heroism of the journalists, so that in its conclusion the survivors are given the just acknowledgement for allowing the story to be exposed. Lighting, fashion, wordplay; anything that could jolt you into remembering that you are watching a Oscar nominated stilt is unseen and irrelevant when put against the undeniable truth of what the film is saying and the foreshadowing aftermath of that. Rather, this is a film with documentary significance, with no time or mind to consider anything outside of its context, a context that can’t be taken lightly in any form. Spotlight takes the history of these events, the allegations, out of their black and white context to provide a deeper insight into what happened, why it happened and how it affected those exposed, their victims, families of victims, society and the Church. It speaks of the “spiritual abuse” of those affected and what it did to their faith. A scene which is particularly difficult to watch is Pfeiffer’s grandmother, a regular church go-er, as she reads the published report in front of her granddaughter with great discomfort. Pfeiffer, like the rest of Spotlight, has to deal with a different effect of what she has exposed – the devastation after the revelation of the people who dedicate their lives to their faith and to their faith in the church. It’s clear that this movie forcefully seeks out a broader concept to run along the stories’ parameters, that of human trust and what happens when you lose it. As a cinema goer, a member of society, a person of faith and a person without faith, this is a ‘movie’ you should set aside time to see. “This [film] is for the powerless. This is for the powerful who take advantage of the powerless.” – Michael Keaton at the Screen Actor’s Guild Awards 2016.